The schnauzer types: Miniature, Standard and Giant. A schnauzer is a type of dog breed that originated in Germany in about the 14th century. The Standard Schnauzer is the oldest of the three Schnauzer varieties: Miniature, Standard, and Giant. All three varieties have the distinctive whiskers, mustache and eyebrows, which is where they take their name from as in German schnauzer means moustache. The Standard Schnauzer is the prototype from which the other two were bred. From the middle ages on they guarded the livestock and family members. They are descended from European herding and guard dogs. As a distinctive breed, they appear in pictures of the 14th and 15th centuries. As far as can be determined they were bred from the Gray Wolf Spitz, the German poodle (pudel) and the Wirehaired Pinscher. About the middle of the 19th century German dog enthusiasts took an interest in the Schnauzer. Dog breeders experimented by crossing them with other breeds. 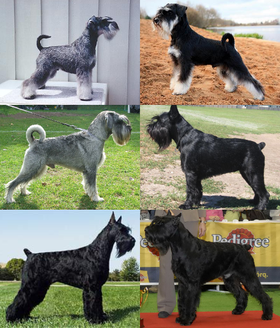 First the Miniature Schnauzer was developed, then the Giant Schnauzer. A Miniature Schnauzer is an energetic and sturdy little dog. Miniature Schnauzers are also very intelligent dogs. They stand between 14 and 16 in (360 and 410 mm) tall at the shoulder. They normally weigh between 13 and 15 lb (5.9 and 6.8 kg). The normal colors are salt and pepper (a mix of off-white, gray and black), all black, and black and silver. They resemble the Standard Schnauzer from which they were bred. They were first shown as early as 1889. The Standard Schnauzer is the original breed of Schnauzer. German farmers in kept them as hunting dogs, rat catchers and watchdogs. They are a medium-sized dog with a hard, wire-like coat. It is a strong and very quick dog for its size. It is able to cover distances easily. Like all Schnauzers they have the same whiskers, eyebrows and mustache. They stand between 17 and 20 in (430 and 510 mm) tall at the shoulder. Standard Schnauzers normally weigh between 35 and 50 lb (16 and 23 kg). The colors are usually salt and pepper or solid black. The Giant Schnauzer resembles the Standard Schnauzer, only they are bigger and stronger. They are very muscular dogs. They stand as much as 27.5 in (700 mm) tall at the shoulder. They can weigh about 95 lb (43 kg). The double coat is either solid black or “pepper and salt.” Much the same as their two smaller cousins they have the distinctive whiskers, eyebrows and mustache. The breed was developed in the areas around Württemberg and Bavaria as a farm dog. They were used to drive livestock to market. During World War I they were used as military guard dogs and as police dogs. They still work with police today and also as Search and rescue dogs. They are also popular as guard dogs. ↑ "All About Standard Schnauzers". PET360 INC. Retrieved 11 January 2016. ↑ 2.0 2.1 "Meet the Standard Schnauzer". American Kennel Club. Retrieved 11 January 2016. ↑ "Standard Schnauzer". PetMD. Retrieved 17 January 2016. ↑ 4.0 4.1 4.2 4.3 "Breed Information About the Standard Schnauzer". Standard Schnauzer Club of America. Retrieved 11 January 2016. ↑ 5.0 5.1 "History of the STANDARD SCHNAUZER". korppret. Retrieved 17 January 2016. ↑ 6.0 6.1 "Miniature Schnauzer Guide". Animal Planet. Retrieved 17 January 2016. ↑ 7.0 7.1 "Meet the Miniature Schnauzer". American Kennel Club. Retrieved 17 January 2016. ↑ 8.0 8.1 "Standard Schnauzer". Vetstreet. Retrieved 17 January 2016. ↑ 9.0 9.1 "Meet the Standard Schnauzer". American Kennel Club. Retrieved 17 January 2016. ↑ 10.0 10.1 10.2 10.3 10.4 "Meet the Giant Schnauzer". American Kennel Club. Retrieved 17 January 2016. ↑ Daphne Cooke (1988). "Is A Giant Schnauzer the Right Dog For You?". Giant Schnauzer Club of America. Retrieved 17 January 2016. Wikimedia Commons has media related to Schnauzer. This page was last changed on 18 June 2018, at 03:12.